Pink, I had that same silver LG phone. I loved that darned thing! (even after I lost the two side pieces). Now I have the Samsung sgh d807. I also HATE clamshell phones. They are a pain to get open and I feel like they always break. I don't think it says anything about me, except that I hate clamshell phones and I wanted one that wouldn't break. I've dropped it from 2 stories (whoops!) and it's still going strong. I never get new phones, I hate learning new technology, and I only recently figured out how to switch between callers. BUT, it takes good pictures and it gets great reception, so what more could you want? And my current ringtone is Underdog by Spoon, with a back-up ringtone of Mushaboom by Feist (for Chris). It's hard to get Indie pop ring tones! 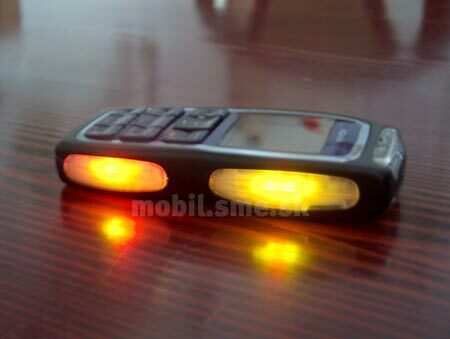 I am currently using an old nokia that we had lying around (I think from about 2001 or something). The frist cell,that I had was Nokia 252c.It was a Trac-phone(aka pre-paid).It was pretty fairly easy to use and understand.The thing i hated about it,was the mins were soo high. Now have a other Nokia 1800,it too is a pre-paid aka Net-10.It too is pretty easy to use and operate.Also the mins are much much cheaper.I call any-where in the U.S. and some of Canada for 10cents per min.Texting is cheaper too...its 5cents per text message.I use it for all my long distance calling,instead of useing the house phone.When I buy mins,i buy a 300min card....its only $30. 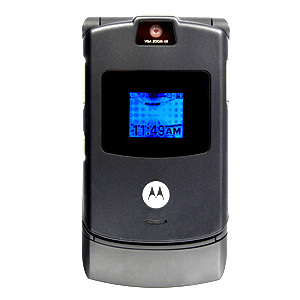 I have a black motorola razr v3. I'm not sure what it says about me though, but I like it's options. edited to add: I change them whenever I wear the last one out. I had my last motorola for 3 years. This is the exact same phone I have. I like it's size and the fact that I can slide it into almost any space, cuz I don't always carry a purse, esp when I walk my dog. I've had it for two years, no problems, knock on wood. Mine really liked remote controls when they were puppies. Among other things, of course. I had noooooooooooooooo idea. It lights up like a Chrstmas tree. I never read the instruction manual and don't ever know what a phone does except take calls and dial numbers, and that's all I wanted. I bought it because it's purple. So the first time that it rang, I was waiting in line to buy a train ticket. That was soooo embarrassing, I had a phone that could have made a teenager happy, not me So for the first time I had to read the instructions in order to find out how to get rid of the discotheque in my phone . sheeesh. Great minds think alike! I'll tell you what else I like about this one, compared to my old motorola. I like how the camera eye is protected behind a glass (or plastic??) window. It makes it easier to keep dust and dirt off the camera lens. 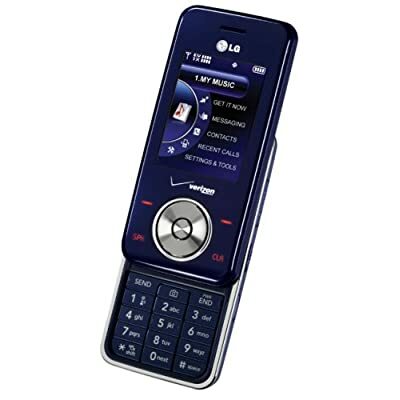 It also has an MP3 player, which is the main reason I chose this one. But, I have yet to download music to it. Been too busy! She loves remote controls too. What type of dogs do you have? And how old were they when they grew out of the chewing? Your post made me laugh so hard! I can't imagine how embarrassed you were when it lit up! I have a Nokia 3130, I think. It's black and silver-colored along the sides. Don't know quite what it says about me though. I got it because it looks good and has triband, so that I will be able to use it with no problems when I move to the US next year. I will use it till it wears out of course, no reason to buy a new one before that. I have a Motorolla Razr because it was CHEAP. I couldn't care less about what phone I carry. One's lab/boxer and the other is mostly lab/blue heeler. They were both nearly two before I could really trust them, but the most destructive phase was probably between 6 months and a year. They'll still get food off the counter and try to raid the cat's litter box, but they leave non-edible things alone now.